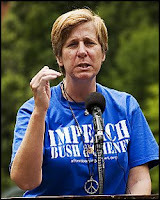 Anti-war activist, Gold Star Mother and peace mom Cindy Sheehan will appear on Kudlow and Company this evening for a one-on-one interview. Earlier this week, Ms. Sheehan announced plans to run as an independent against Nancy Pelosi next year if the congresswoman doesn't move to impeach President Bush by July 23rd. The crux of her early stage campaign is built around Bush being impeached and an immediate end to the war in Iraq. Of course, I strongly disagree with Ms. Sheehan’s proposals and her politics. And while I intend to give her a respectful hearing, I will of course challenge her opinions. Please join us tonight at 5pm ET on CNBC.